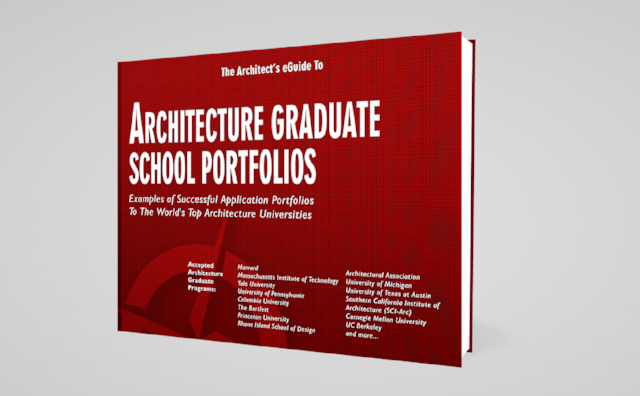 The Architect's eGuide To Architecture Graduate School Portfolios: Examples of Successful Application Portfolios To The World's Top Architecture Universities. One of the most difficult components of the architecture graduate school application process is the portfolio. Many of the questions I receive throughout my interactions with applicants revolve around this mysterious document. The purpose of this guide is to take some of the mystery out of architecture portfolios. By providing effective examples, this guide breaks down the overwhelming task of creating a portfolio into manageable pieces. Many years ago when I put my first portfolio together I had to learn everything the hard way. I want to give you the information to represent yourself in the best way possible. This book is my contribution to what I see as an undeserved area. If you are thinking of applying for an architecture graduate program in the near future this is a great resource. This includes over 800 pages of successful application portfolio examples to the world's top architecture graduate programs. Learn what gets results at some of the top schools including Harvard, Yale, Princeton, Columbia, MIT, U Penn and more. Check out the link below (and get a free sample).